Mexican cuisine is making a comeback in NYC. It's just the beginning, and soon you won't have to travel to California, Texas, or Mexico, for great Mexican. In fact, you should take a trip to 9th Street and 2nd Avenue in the East Village to get some straight up taco perfection at Otto's Tacos. This little joint just opened up last week, and with a chef from California, they sure know what they are doing here. It's an LA-inspired grab-and-go taqueria, focusing on freshly prepared tacos. They make all their tortillas, salsas, and marinades from scratch every day. All they serve is tacos here, along with a few sides, but the tacos are great. I tried three last week and was happy as can be. Carne Asada ($3) was delicious. Shrimp ($3.50) fabulous, and the one that blew me away was the Carnitas taco ($3). With such amazing flavor, juiciness, and tenderness, this taco brought a tear of joy to my eye, and taste of LA to my stomach. Order all of them. You'll be glad you did. Also, a side of masa fries ($3) was delectable, and churros ($2.50) were sensational. Otto's Tacos states their goal is to "bring a bounty of bold flavors from our kitchen onto your plates". They do that with flying colors, or in this case "flying salsas". 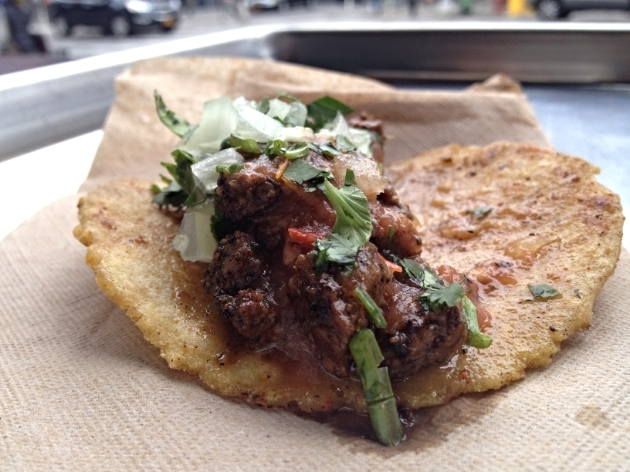 So, save your airfare out west, and grab some taco heaven in the East Village. Olé!